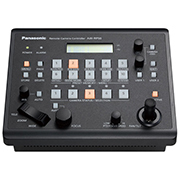 This remote camera controller unit can control up to one hundred cameras via IP; and up to five Panasonic cameras and pan-tilt heads using RS-422 serial control. The RP50 is capable of accessing up to 100 presets for each Panasonic Integrated PTZ camera (AW-UE70, AW-HE40, AW-HE130, AW-HE50 and AW-HE100); and up to 50 presets for other Panasonic AW-series pan-tilt heads. The half-rack width RP50 has a simple; ergonomic design for easy operation in a wide range of applications - including remote production; sports; education; legislative TV; and house of worship use. In addition to easy; precise pan; tilt; zoom; focus; iris; white balance; black balance; and shutter adjustments; the RP50 also provides direct setting of detail; R/B gain; and R/B pedestal adjustments on many cameras for convenient matching of video output. Camera menu access is also provided for adjustment of other parameters.